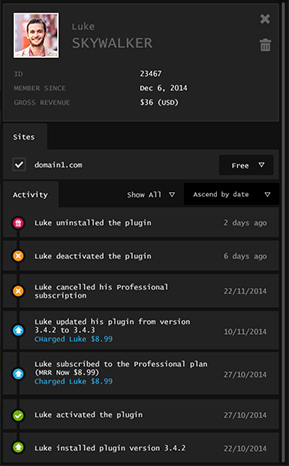 Configure your plugin's or theme's plans and pricing on freemius developer's dashboard. Embed our WordPress SDK into your plugin or theme by wrapping your premium features with plan related logic. Freemius will enable everything required to convert your users into a paying customer. Let Freemius take care of the rest! There's no reason to stay blind when you don't have to. Become a data driven business. 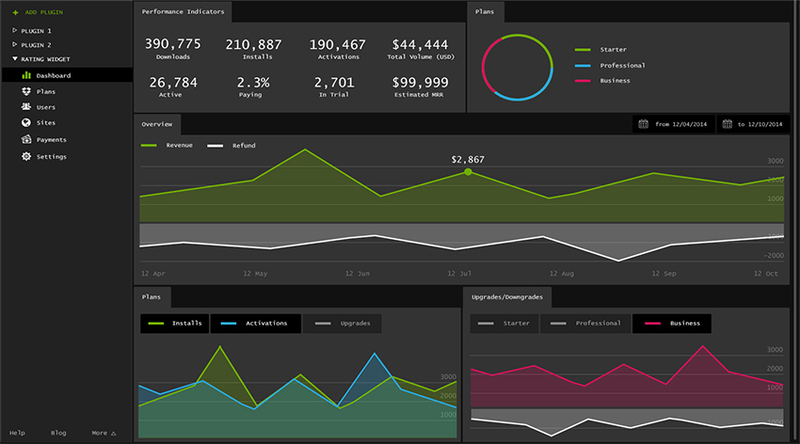 Get your key metrics in one place. Secure & friction free upgrade process right in the admin dashboard. Leverage the distribution of the .org repository. 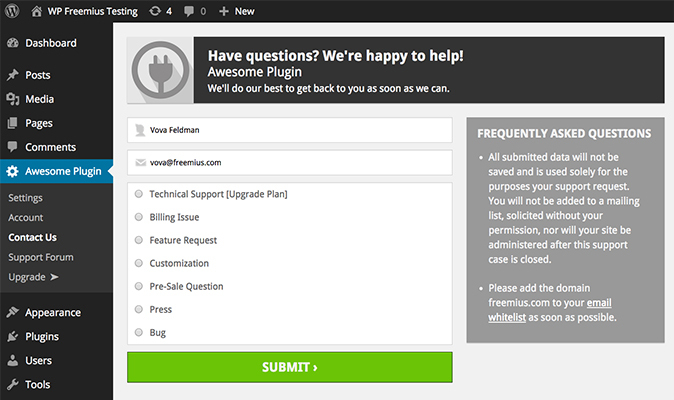 No more dual code maintenance headache - build one plugin or theme and Freemius will auto generate the free version. 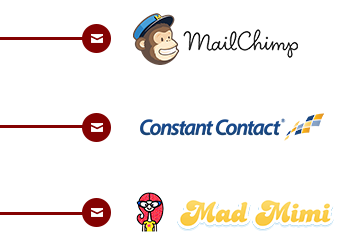 Straightforward users' export to any of your favorite email services. 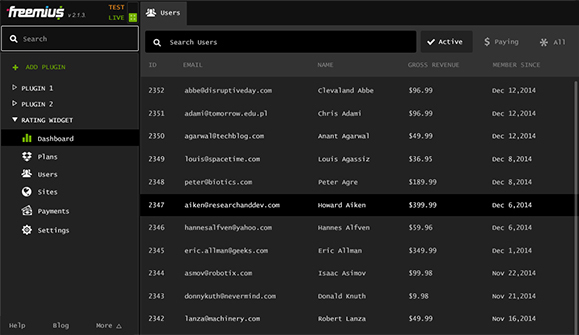 Direct communication channel from within the dashboard, delivered right to your mailbox. Deployment through Freemius automatically populated to users' admin dashboard with push notification and one click update. Am I required to have a premium version? Not at all. You can leverage our user management and in depth analytics by integrating Freemius into your plugin or theme without having a premium version. Can I use Freemius if my plugin is hosted on WordPress.org? YES YOU CAN! WordPress.org is a great source for "free traffic". 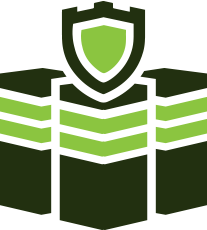 We designed the deployment process to keep your free plugin or theme fully compliant with WordPress.org guidelines. Will this work with other platforms like Drupal? We designed Freemius to work with any platform by designing a robust RESTful API. Having said that, we are currently focused on WordPress plugins and themes, and built a designated WordPress SDK that makes the integration ridiculously simple. We will be building more custom platform SDKs soon. I want to monetize with add-ons, will this work? YES! 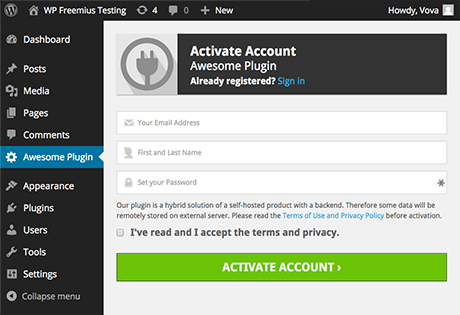 We are proud to be fully supporting the Add-ons model to power your plugin or theme. I have a free plugin, why should I monetize it with a freemium model? If you find the time to continuously add features, maintain the plugin and provide support for your users, all for free - you are really awesome and please keep doing that! But that's not the usual case, if you want to spend more time improving your plugin and providing great support, you'll have to find an additional source of income for that time. Wouldn't it make sense to get the money from the plugin?! Everyone will be happy - your free users will get a better supported plugin. Your paid customers, will be happy to pay for the extra features in the premium version.